Quality: Proven build over years of testing, customer records and Amazon reviews. 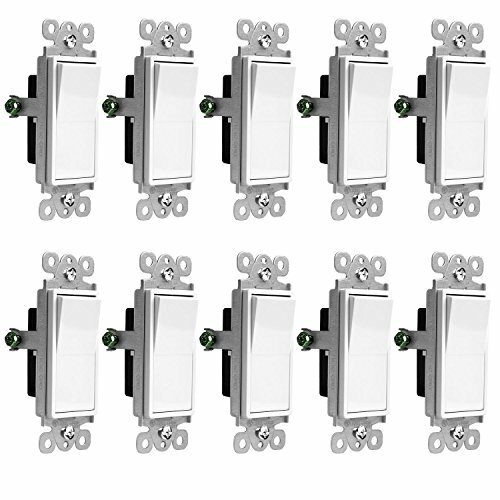 The Impact Resistant, Thermo-Plastic Body protects the rocker light switch from wear in high traffic areas in bedrooms, kitchens, bathrooms, living rooms, restaurants, schools, lounges, offices and airports. Design: With a modern decorator style look, the decor single pole switch features smooth ON and OFF paddles for reduced clicking and a stylish white gloss finish that matches perfectly with all Enerlites decorator wall plates. Application: Suitable for residential and commercial areas, the 3-Way (multi-location) enerlites switch can be installed in a multitude of locations varying between Homes, Offices, Business Buildings, Airports, Schools, Public Restrooms, Hospitals, Hotels and more. Heavy Duty: UL Listed, 15A, 120V-277V (AC), 3-Way (Multi-Location), Thermo-Plastic Body with breakable plaster ears, Compatible with LED, CFL, Incandescent, Halogen and Fluorescent lighting, Steel Alloy Frame with Grounding Screw. Installation: Simple and straight forward installation instructions. 3 Wire Grounded Electrical Connection. No Neutral needed. For 3-Way Light switch applications.